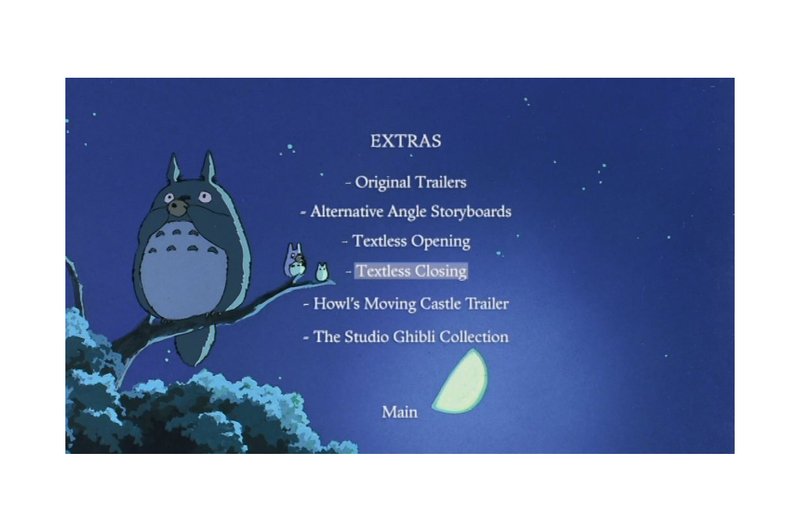 Rare is the film that is truly befitting of the word “timeless.” But Hayao Miyazaki’s My Neighbor Totoro is one such film, an animated masterpiece that’s entertained generations of viewers since its theatrical release in 1988. 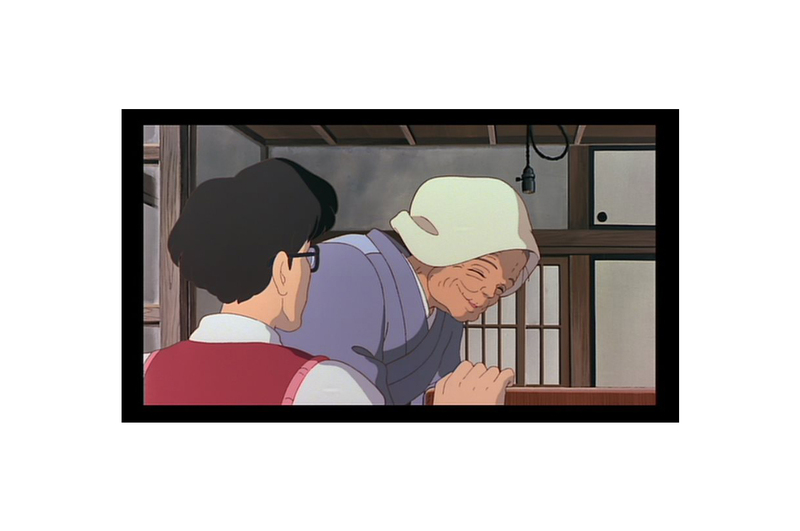 Sadly, despite the veneration enjoyed by Miyazaki and Studio Ghibli for a work of art such as My Neighbor Totoro, not everyone is inclined to extend to them the respect they deserve. Movie pirates don’t care a whit about respect; all they’re concerned with is making a profit. To make matters worse, they also don’t care about quality, as evidenced by the mountains of hideous, nigh unwatchable bootlegs they produce annually. 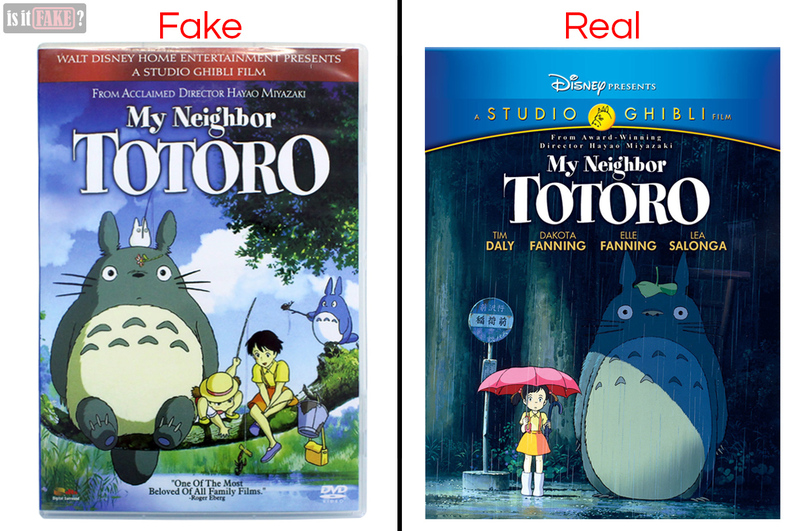 Today’s article tackles a counterfeit My Neighbor Totoro DVD. So why not stick around? You might learn a thing or two about what makes a fake such a terrible purchase! The internet is home to hundreds of online stores engaged in illicit practises. 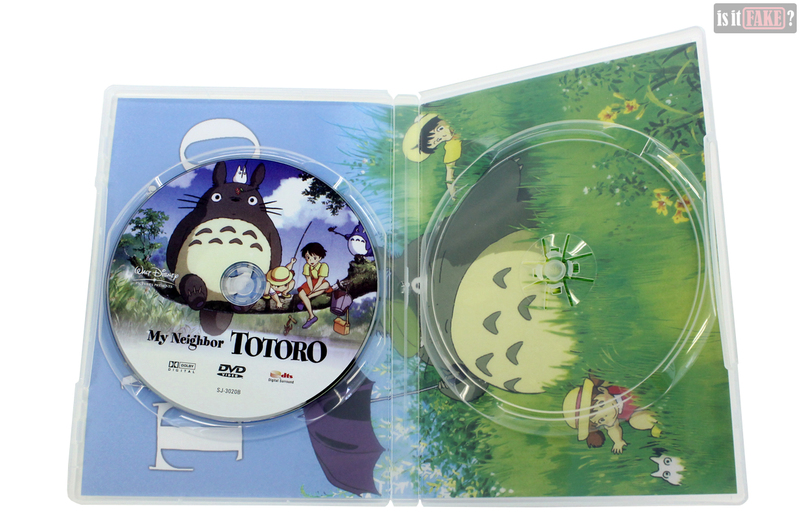 One of them is based in Malaysia, and it’s from this store we obtained this fake My Neighbor Totoro DVD. This particular fake is a tricky one, as its packaging is a near-exact replica of the original product’s. Nowhere on its cover is the name of its illegal manufacturer mentioned. Its page on the online store, however, identifies said manufacturer as Kedai Buku Topwin. A few Google searches might convince you that Kedai Buku Topwin is a legit business. It’s got physical stores, websites, and even a presence on social media. What’s most revealing, however, is that there’s no evidence Studio Ghibli ever granted the My Neighbor Totoro rights to Kedai Buku Topwin or any other Malaysian company. The reality is that the lack of valid licensing doesn’t stop shadier Malaysian companies from illegally manufacturing and distributing products. Some of these companies are even registered with the Malaysian government. It therefore pays to be extra careful when dealing with items made in Malaysia, as some of their fakes are designed specifically to play you for a fool. Armed with a little knowledge, however, and you’ll be able to spot those clues that should identify an item as a fake. 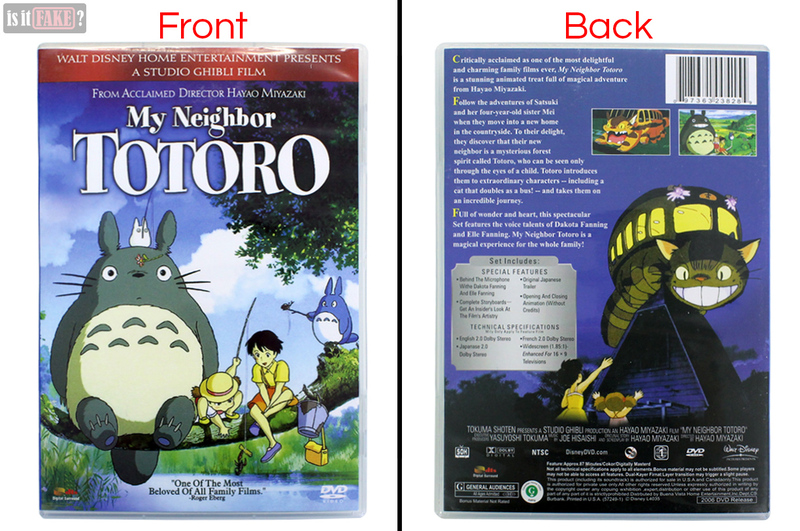 Read on to find out how we unraveled the truth about this My Neighbor Totoro DVD! 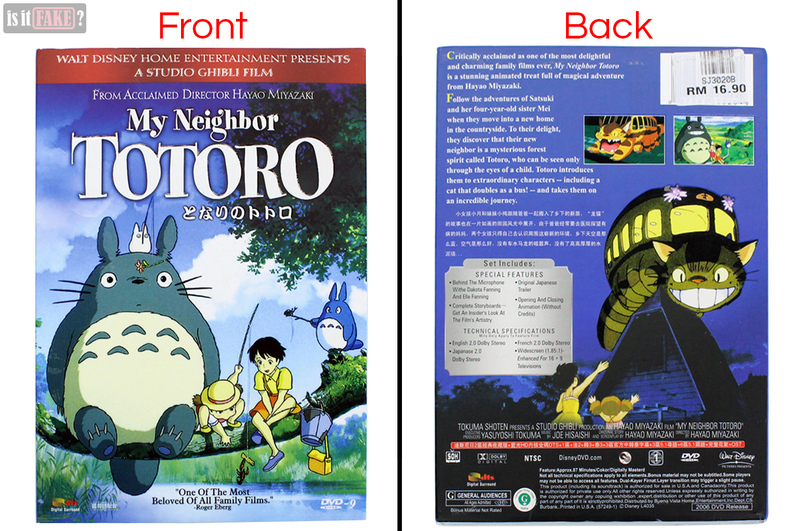 The fake My Neighbor Totoro DVD is packaged in a stiff cardboard box that, as mentioned earlier, is an extremely close reproduction of an official DVD’s, specifically one released by Disney in 2006. The visuals on both the front and back of the box cover are the same as this original’s, as are the text and details. But there are variations that won’t escape even the casual observer. For starters, the original’s artwork boasts much richer colors and more defined lines. The fake’s colors are also off, with Totoro’s grey fur showing a hint of blue. 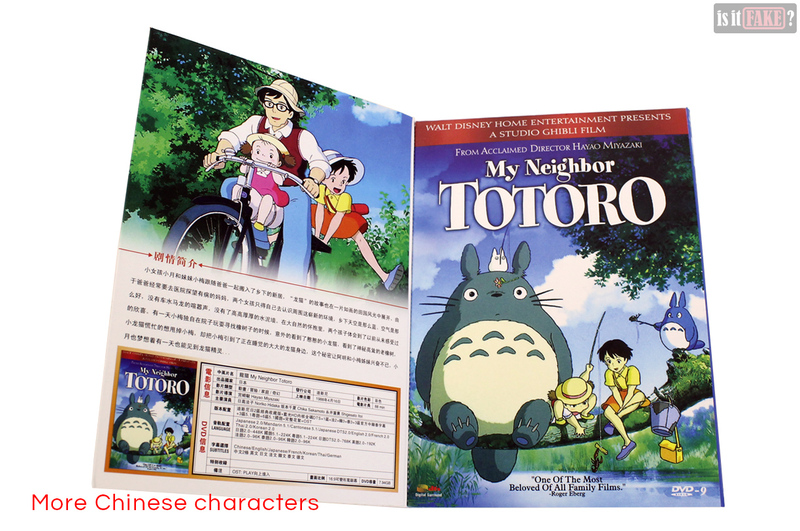 On the back, we see the official 2006 version’s English synopsis of My Neighbor Totoro. The synopsis is incomplete, however, as Chinese characters have now taken the place of the third paragraph. Having Chinese here (and anywhere else on the packaging, for that matter) is odd, as Disney’s 2006 DVD only supported English, French, and Japanese. 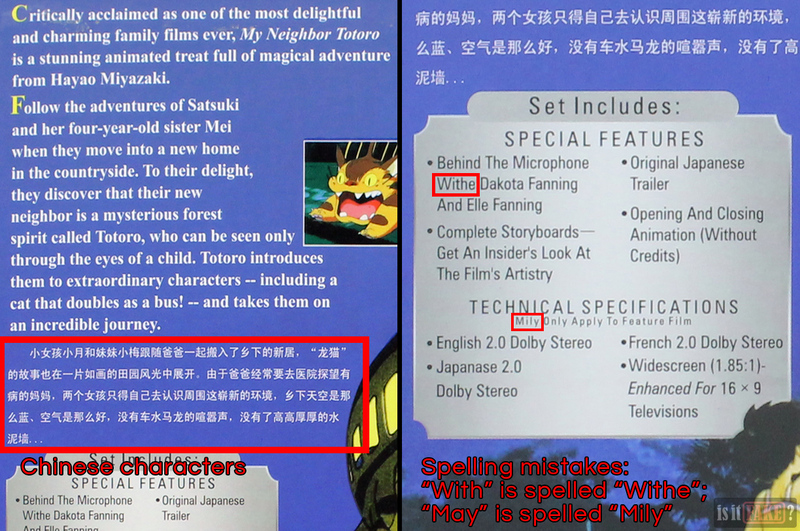 Below the synopsis and Chinese text, the detailed list of the DVD’s special features and tech specs is marred by two spelling mistakes. At the very bottom, we’re once again treated to the DTS sound system logo. Below the names of the production team are more Chinese characters. The text below this is chock full of spelling and spacing problems. The front cover of the box is in fact a flap that swings open to reveal the DVD plastic case inside. On the interior side of this flap is a body of text in Chinese, as well as more tech specs. You’ll notice the tech specs on the back of the box are inconsistent with those on the interior side of the flap. 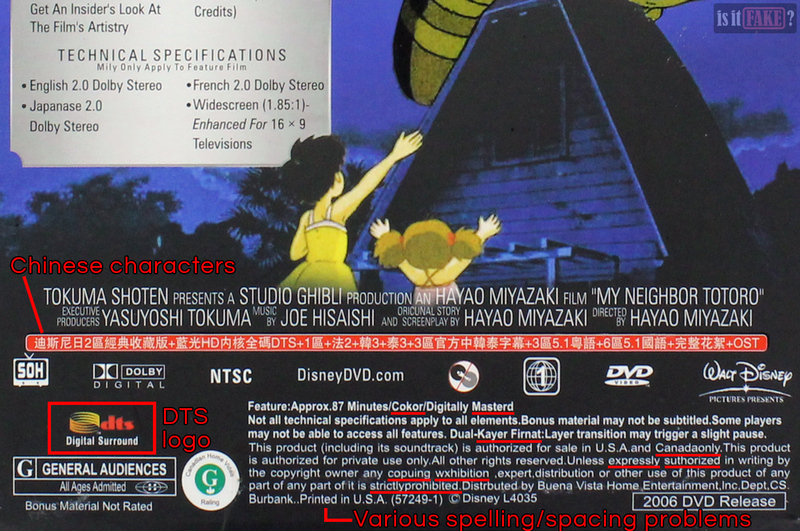 According to the back, the DVD comes with English, Japanese, and French audio. 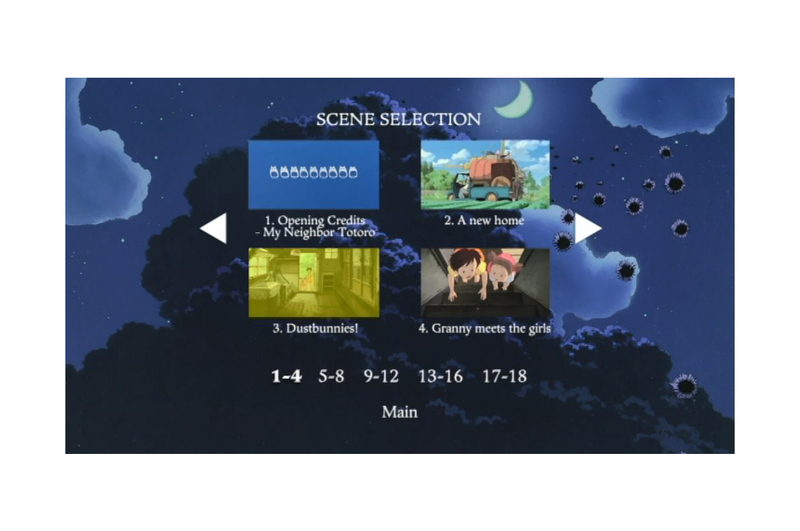 However, the interior claims the DVD additionally supports Mandarin, Cantonese, Thai, and Korean languages, and subtitles in Chinese, Korean, Thai, and German. The visuals and text on the plastic DVD case is similar to those on the box. The main difference is that the Chinese characters next to the DTS sound system logo have vanished. With them gone, you can now see the horrible image editing applied to the cartoon water plants. Some have broken, disconnected stalks, while others seem to have been poorly cloned. 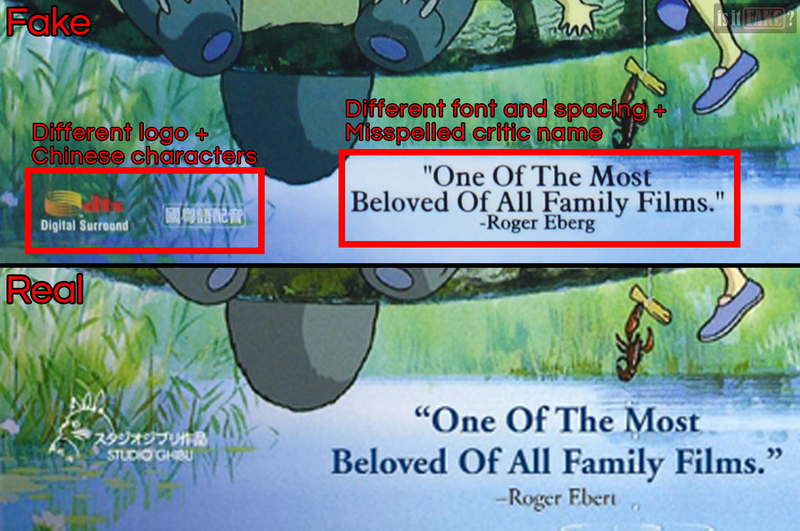 This is proof that the image has been tampered with to remove the Studio Ghibli name and logo and replace it with the Chinese characters and DTS sound system logo. Our DVD and media player had no trouble running the movie. 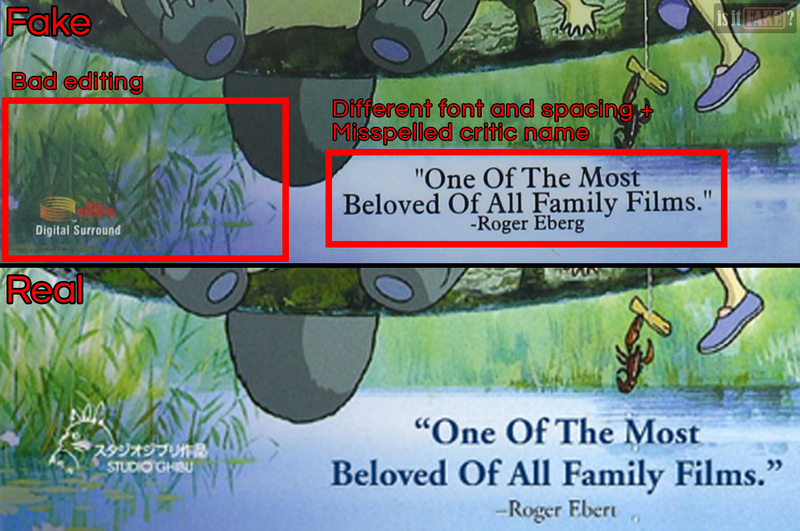 From the appearance of the various menus, it seems the fake is a rip of an English release of My Neighbor Totoro. It’s strange, however, that according to the language setup menu, the product has no support for French, which the the Disney 2006 DVD release has. It’s therefore possible that this is a rip of a different English release, or a version of Disney’s 2006 release that has no French audio. But here’s where it gets even more bizarre. According to the language setup menu, the product comes with three language settings: English with no subtitles, Japanese with English subtitles, and English with captions for the hearing-impaired. When we selected English with no subtitles, however, what we got was Japanese audio with no subtitles. When we picked Japanese with English subtitles, we were treated to Chinese audio with Chinese subtitles. And when we opted for English with captions, we ended up with Japanese audio with Chinese subtitles using a peculiar font. 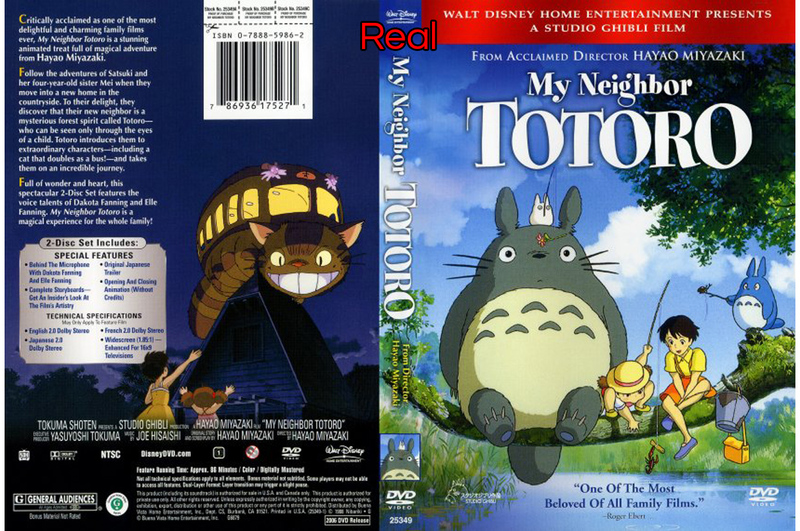 Unless you speak Japanese or Chinese, you won’t understand a word of this fake My Neighbor Totoro. You won’t enjoy the picture, either, as the colors are on the drab side. 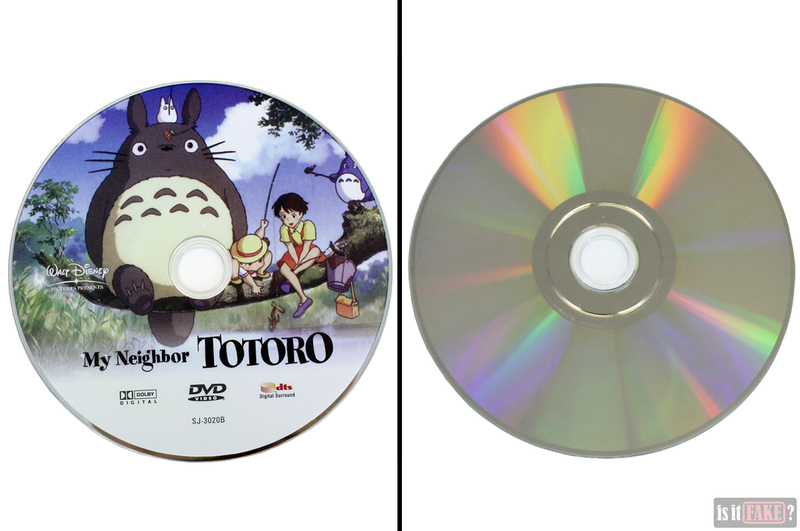 There is no shortage of licensed My Neighbor Totoro DVDs in legit online stores. The good news? They’re not that different from the fake in price. 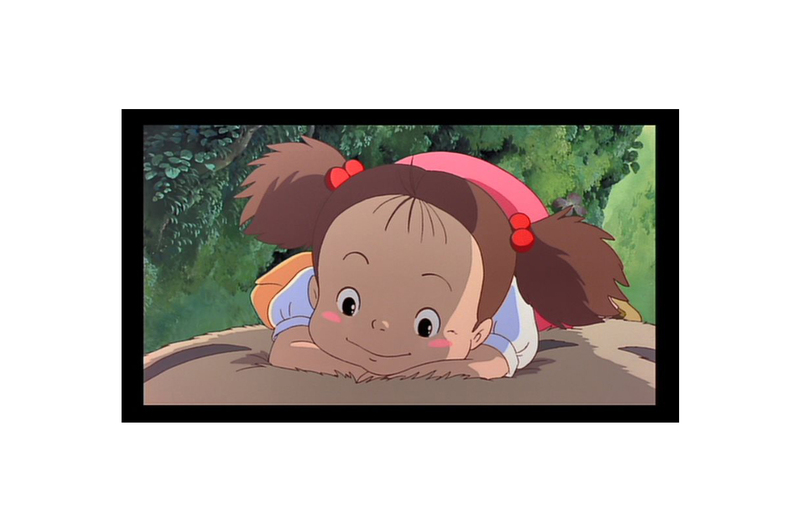 My Neighbor Totoro is available in Disney’s online store. Its Disney store page will lead you to an Amazon page. 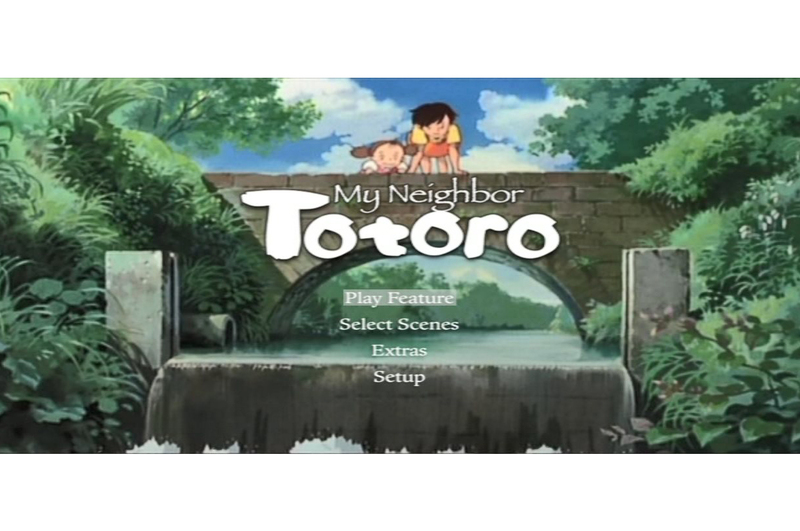 This Amazon page allows you to select among the the DVD, Blu-Ray, and multi-format versions of Disney’s My Neighbor Totoro release (just make sure to purchase directly from Amazon, and not from the third-party sellers). This is the release starring Dakota and Elle Fanning, Lea Salonga, and Tim Daly. It has English, Japanese, and French languages, and English and French subtitles. 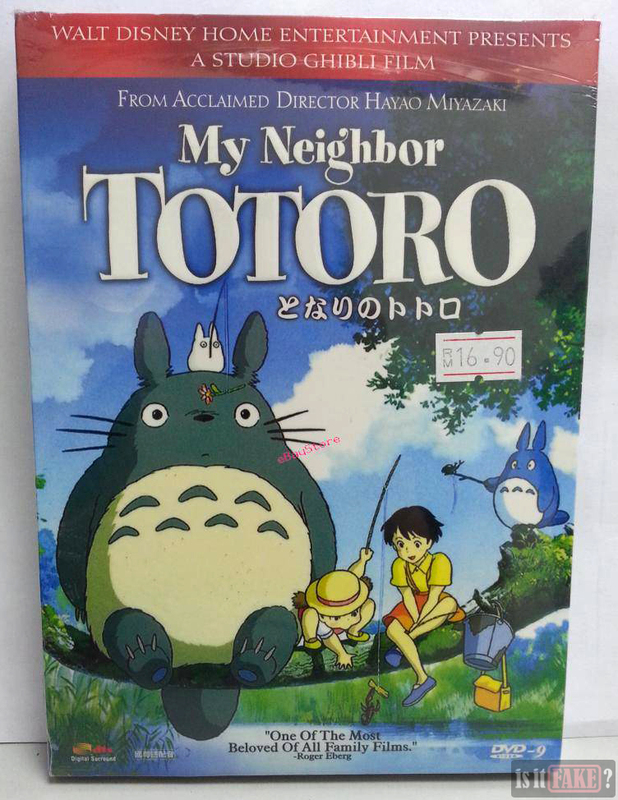 My Neighbor Totoro is available on Amazon Japan. The film can also be found in Madman Entertainment’s online store. 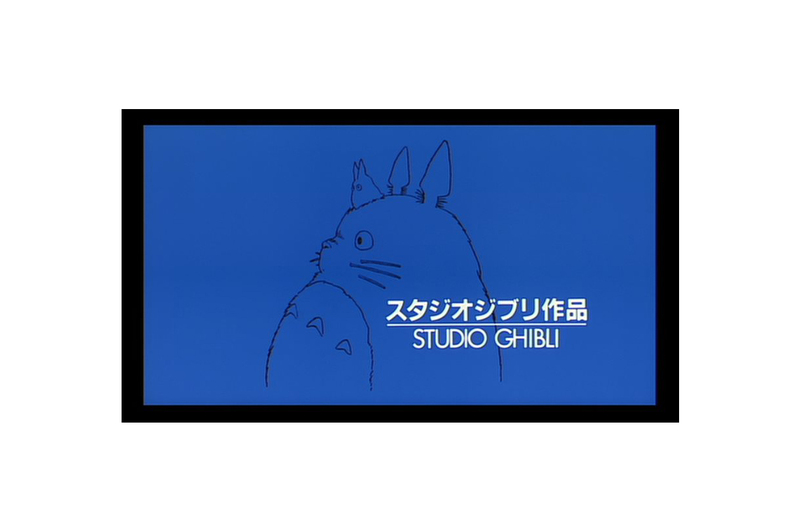 A classic as beloved as My Neighbor Totoro deserves more than a shoddily produced bootleg further brought down by average quality visuals and audio that can’t be understood by many of its most ardent fans. This fake gets an 85% terrible rating for failing both the film and its viewers.